The Marjorie K. Daugherty Conservatory, Omaha’s new, world-class, 17,500 square foot conservatory, opens Saturday, October 11. From lush tropical gardens with soaring palms and vibrant flowers to temperate gardens with moss-covered live oak trees and blooming azaleas, the $31.2 million conservatory will be a spectacular addition to our cultural landscape for all four seasons. The Marjorie K. Daugherty Conservatory, Omaha’s new, world-class conservatory, opens Saturday, October 11. In its entirety, the new addition adds almost 20,000 square feet to the existing visitor and education center, including 17,500 square feet of indoor space for horticultural displays. It will usher in a new era of horticulture for the Omaha metropolitan area and for the surrounding region and will be a place where plants will burst with life year-round. From lush tropical gardens with soaring palms and vibrant flowers to temperate gardens with moss-covered live oak trees and blooming azaleas, the conservatory will be a spectacular addition to our cultural landscape for all four seasons. The $31.2 million project marks a collaboration between the architecture and engineering firm HDR, Inc., the conservatory consultants Rough Brothers, Inc., landscape architecture firm CG Studios, Inc., the general contractor Peter Kiewit & Sons, Inc. and Heritage Services, Inc., who led the fundraising effort, provided design and construction oversight, project administration and donor stewardship. The Robert B. Daugherty Foundation joined with many others in the community to generously support the effort. Entrance to the Marjorie K. Daugherty Conservatory will be included with paid garden admission of $10 for adults, $5 for children 6-12 and free for children under 6 and garden members. It will be open daily from 9 a.m. to 5 p.m. during regular hours of operation, and will be closed on Thanksgiving, Christmas and New Years Day. The forms found in the tropical heliconia flower, as well as Lauritzen Gardens’ own logo inspired the exterior design of the conservatory. Taking the logo’s arched shape as a base point, the conservatory emerges from the hillside in a series of extrusions, each smaller than the previous. The different bays all feature canopies that overhang in alternating directions, mimicking the organic shapes seen in a budding heliconia, and the ridgelines all angle upwards, to visually evoke the idea of growth from the hillside. Though simplistic in its materials, the steel framing and 12,000 glass panels will allow the conservatory to function as an optimal plant growing environment, to foster plants that would not survive in our local climate. 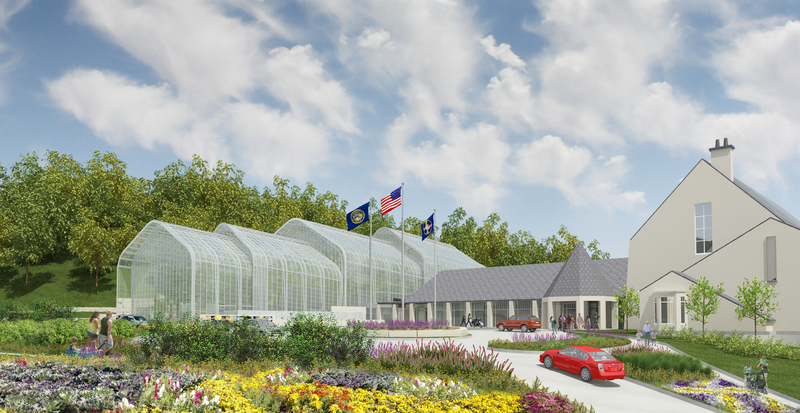 The conservatory is designed to complement the existing visitor and education center, using similar elements such as natural stone and stucco to seamlessly weave the visitor and education center and the conservatory into the green tapestry of the garden. With the visual appearance the glass structure is growing from the hillside, the conservatory’s uniqueness lies in the gradual twenty-foot rise in elevation that visitors experience from the entry to the northern end. This provides surprises around every corner, including a ten-foot waterwall, dramatic glimpses of the contrasting conservatory plantings, a large pool with exotic water plants- and culminates with an outlook over the beautiful Missouri River valley and the entrance to the garden’s woodland trail, a century-old forest in the middle of the city. Unlike most conservatories today, which interpret ecosystems or focus on specific plant communities, the Marjorie K. Daugherty Conservatory will focus on what Lauritzen Gardens does best, gardens. Older conservatories were built as garden settings or plant collections of exotic plants that were displayed in a gardenesque way. The interior of the conservatory at Lauritzen Gardens is inspired by these historical conservatories, and is designed to showcase the beauty of a traditional garden in the southern United States in the 5,300 sq. ft. temperate house and collections of elegantly displayed tropical plants in the 10,000 sq. ft. tropical house. A 2,000 sq. ft. gallery space for unique floral displays and private/special events makes up the remainder of the conservatory space. The development and opening of the conservatory realizes a vision established by the garden’s founders in the early 1980s. Their plan included outdoor garden areas that celebrated native plants, but also included the idea of a dramatic four-season conservatory that would contain a fantastic collection of unusual plant life, not native to our area and seldom seen by our community. In 1996, the conservatory became a permanent part of the garden’s master plan for growth. In 2010, a feasibility study was conducted that assessed the need and viability for a conservatory in Omaha. The results launched the efforts that led to the building of the Marjorie K. Daugherty Conservatory. Heritage Services, Inc started the fundraising campaign in 2011. New plans were drawn by HDR, Inc. in 2012. Ground was broken on the project in April 2013, with site preparation and construction beginning right afterward. The opening of the Marjorie K. Daugherty Conservatory also marks the re-opening of the ten-acre woodland trail, Lauritzen Gardens’ century-old grove of bur oak forest. The paved paths inside the conservatory will culminate at the new entrance of the woodland trail, allowing easy access for visitors. The woodland trail provides an escape into unfettered nature with the convenience of a mulched path, winding past a native plant community that includes: American hophornbeam, gooseberry, Kentucky coffee tree, shagbark hickory, and other plants of interest, creating a dramatic contrast to the cultivated garden areas. The woodland trail also provides incredible panoramic views of the Loess Hills, Missouri River and Omaha skyline. 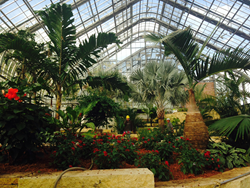 Lauritzen Gardens is an urban oasis of beauty and tranquility. This 100-acre botanical garden, comprised of several outdoor garden areas, creates a living museum of unique four-season plant displays, maintained to the highest standards consistent with environmental stewardship. Lauritzen Gardens is open from 9 a.m. to 5 p.m., and the café serves lunch from 10 a.m. to 2 p.m., every day except Thanksgiving, Christmas and New Year’s Day. Admission to Lauritzen Gardens is $10 for adults and $5 for children ages six to 12 and free for members and children younger than six years old. Lauritzen Gardens is conveniently located in the beautiful riverfront hills at First and Bancroft Streets and is close to the Henry Doorly Zoo & Aquarium and the Old Market. For more information, please visit http://www.lauritzengardens.org or call (402) 346-4002.